Let's admit it. Although it's a lot of fun to play with a dog, it can be exhausting too. There's no shame in adopting lazy dog breeds simply because you want to spend less time outside and more time laying on the couch with your best friend. 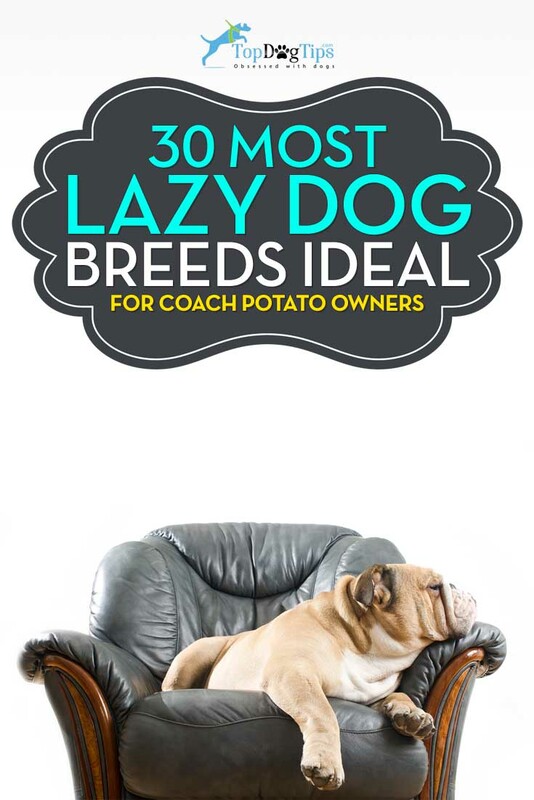 These 30 lazy dog breeds may be just what you're looking for – an ideal couch potato companion. Don't get me wrong, you'll need to make sure your pooch gets exercise – no matter which breed you adopt, every canine needs to have at least the minimum amount of physical and mental stimulation for a healthy life. If you think lazy dog breeds are laying around one hundred percent of the time, unfortunately you'll be mistaken. Even the laziest dog will still require daily walks and play time. The difference between lazy dog breeds and more active breeds is that they live a much more sedentary lifestyle. While Labradors will play for a large part of the day, many of the breeds on this list will only be up for a few short walks each day and prefer to spend the rest of the time chilling on their bed or your sofa. If that's what you're looking for, then adopting one of these lazy dogs will get you a perfect companion. 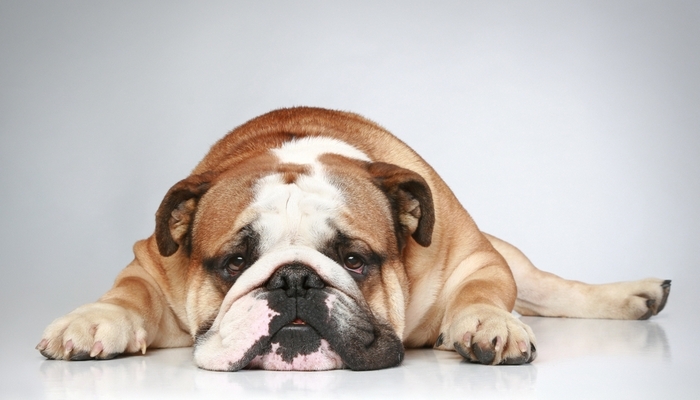 English Bulldogs are patient and kind dogs that love to lounge around with their owners. Because they’re brachycephalic (have a short, pushed in nose) they can’t do strenuous exercise. A quick walk around the park is enough exercise for this lazy breed. This calm and courageous breed will keep you laughing with their silly personality, but mostly they're interested in eating their favorite dog foods and taking many naps. They are small in stature but very rugged, making them a good choice for families with rambunctious kids. Bullmastiffs are the ultimate “gentle giants”. These dogs might be a bit on the lazy side, but they are also brave and loyal to their master. Even though they are a large dog, Bullmastiffs are not active and do very well in apartment settings. These dogs are also affectionate and will try to climb in your lap if you let them. The Cavalier King Charles Spaniel is a lover. This breed wants nothing more than to spend time with their owners and give lots of kisses. They like to take quick walks but are most comfortable curling up on the couch with their companions after a good Cavalier dinner. Affectionate and gentle, the Cavalier King Charles Spaniel is a good choice for a family interested in lazy dog breeds. Bichon Frises love to please their owners. They are very intelligent and love to show off their skills. Obedience training is a breeze with these pups, but some have a hard time with house training. Bichons will get short bursts of energy followed by a very long nap. This is one of the lazy dog breeds that will require a few short walks during the day. They'll burn their energy while outside and then come in and curl up on the couch with you. Originally bred as lap dogs, Japanese Chins are always up for a cuddle.They are very sociable but should be carefully watched around young children. The Japanese Chins idea of exercise is jumping up into people’s laps. The breed actually hails from China, and is a favorite among owners looking for a sophisticated companion. Intelligent and charming, the Japanese Chin is certainly one of the top lazy dog breeds. 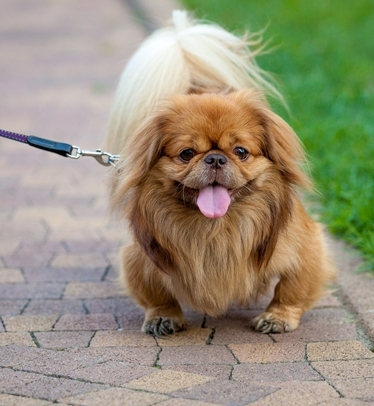 The Pekingese is not fond of exercise at all and that's what they're known for. Their short bowlegs make it difficult for them to run around too much, so they are most comfortable lounging on laps of their trusty pet owners who will care and feed the lazy dog. Pekingese are great lap dogs and are a very popular dog among owners who love to carry their pets around everywhere. Sadly, they are not very good with children and other dogs or animals, but will get along with cats according to many pet owners. Training is a chore with this breed too, because of their stubborn and independent nature. The Dachshund's short stubby legs are a big reason why they make great lap dogs. They enjoy walks but a session of indoor ball chasing is enough to provide adequate exercise, and they're mostly interested in consuming Dachshund-friendly foods and napping a lot of the time. Dachsunds make our list of lazy dog breeds, but these pooches are very opinionated and not great family dogs. Originally bred to hunt, these pups can be spunky and may see a child's antics as a threat. The French Bulldog is another brachycephalic dog, which makes a short walk around the block a big workout for them. They are single owner dogs, perfect for people who live in apartments and the elderly. These adorable pups are very adaptable, and with the right French Bulldog food and exercise they're also healthy. They are also intelligent, making them a wonderful choice for pet owners who wish to travel with their canine companion. The Boston Terrier is a breed that can adapt to any living situation. They love people and are easy to train. These dogs only need short walks. Bostons, as they are sometimes called, are often found by their owner’s side with a chew toy. Their funny personalities will keep you amused, and as long as you feed your pet with best food for Boston Terrier and keep him somewhat active, they will also live a long time. Yorkies are small dogs with large dog attitudes. They are friendly but will assert dominance over anything that comes into their homes. They are very energetic indoors, and like to dash around the house. These short bursts burn a lot of their energy, so Yorkies only require short walks a few times a day. They love to be with people and hate being alone, meaning they are not good dogs for being left for long periods of time. On the bright side, they are generally healthy and live long as long as proper Yorkie diet and exercise is provided. This is a great city and suburb household pet, and a perfect lazy dog for those looking to spend the least amount of time outdoors. Havanese are good and gentle with children and other animals. They only require slow-paced walks and some playtime for the minimum amount of exercise and mental stimulation. This lazy dog breed was originally bred to be a small companion dog and love to be pampered as well as fed their favorite Havanese dog food. Hailing from Cuba, these pup is named after the city of Havana and is the National Dog of the country. The Pomeranian is the typical lap dog. They are spunky and assertive. The big dog in a small dog mentality is a trait that most Pomeranians express frequently. Certainly one of the most lazy dog breeds, and Poms are also loud guard dogs that will certainly let you know if there is something approaching. They need very little exercise, eat very little Pomeranian dog food, and do well in single households because they do not get along with everyone. Maltese are a great social lap dog. They are ideal for apartment dwellers and have very minimal exercise needs. If you're looking for lazy dog breeds that would be ideal for urban households and also one of the most beautiful small dogs around, the Maltese may be right for you! This breed is one of the very mild-tempered dogs, it does well with training based on positive reinforcement, but need to be socialized at a young age to make sure that they are not nippy to strangers or other animals. They tend to get along very well with cats too. The Chihuahua is the smallest of all dog breeds. This makes them ideal for life in an apartment and with the elderly. They only need minimal grooming and exercise. Chihuahuas are not a good fit for a household with small children. They need obedience and socialization starting from a young age, since they tend to be nippy. The pug is a great family dog that gets along with strangers and other animals. They’re small size makes them perfect for apartment and city living, as well as low cost for Pugs eat little food. The poster child for brachycephalic dogs, they only need short walks around the block. Although they are charming and loving, the Pug can also be quite mischievous. They'll keep you laughing, but aren't the ideal breed for pet owners who spend a lot of time away from home. The Shih Tzu is probably the most popular lap dog. They do well in apartment settings because they only need short walks and a quick romp around the house. Shih Tzus love children and other animals, making them one of the top lazy dog breeds for families. On the bright side, if exercised and fed the right Shih Tzu dog food, they are very healthy and live a long time. Affectionate and outgoing, this breed is great for people who travel with their pets. The Shih Tzu is a loving dog who will enjoy spending lots of time with their owner. If you're away from home for long periods of time, this may not be the breed for you. 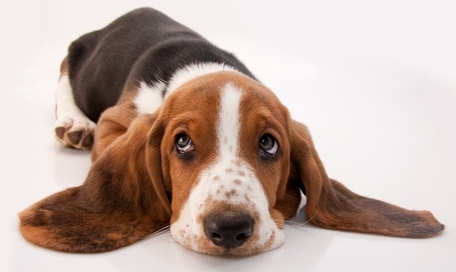 The basset hound is a lover, plain and simple. One of the most well-known lazy dog breeds, they are wrinkly and stubborn but well-behaved pets. Because they slobber and tend to make huge puddles from drinking, Basset Hounds aren’t the best fit for a tidy home. They love to lounge around and cuddle but, they need to have long walks. Keep them on a leash though, because they tend to wander off tracking scents. Also known as the Bichon Bolognese, this breed is very similar to the Bichon Frise. They are an affectionate dog that is ideal for apartment living because they are chill, prefer to lay around a lot and make for great lap pals. This lazy breed is eager to please and do well in obedience training. They only need a few short walks and some playtime to make sure their brain and body stays healthy. Bolognese get along well with gentle children and other animals according to majority of Bolognese pet owners. It is probably a surprise that the Greyhound is on this list of lazy dog breeds. However, though they are known for racing, they can only go short distances and are not made for endurance. Greyhounds love to run around in a fenced in area but, only for a short time before collapsing to nap. The Italian Greyhound is a smaller version of the original and they are a great choice for city living. They only need short walks daily. Because of their thin coat, they need to wear sweaters or jackets in the winter to keep them warm. These well-natured dogs are suited for any living situation. 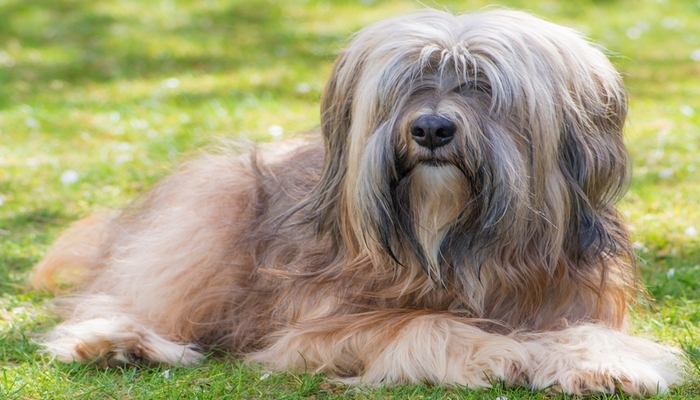 The Tibetan Terrier picks up obedience training easily and enjoys the company of calm people and animals. They are very wary of their surroundings and will let out a warning bark. This is because they were bred to guard Tibetan monasteries. The Tibetan Terrier needs brisk walks a couple times a day. Even-tempered and friendly, many people think this breed is a good choice for families. However, Lhasa Apsos do not do well with small children or strangers and can be nippy. They are small and only need two or three walks a day, which makes them perfect for apartment living. Early training is very important with this breed or your pup may develop some naughty behaviors in the future. The Brussels Griffon is an intelligent dog, and they make loving lap dogs. They enjoy short, slow walks and cuddling with their owners. Early training and socializing is key with this breed, because they bark excessively and can be timid with new people and animals. Alert and curious, these pups can also get themselves into trouble quickly when not supervised. The Clumber Spaniel is a rare breed with only around 200 dogs registered in the United States a year. They are affectionate and easygoing canines. This breed needs daily walks but is not very athletic. These dogs can be quite amusing, and their mellow temperament is ideal for owners looking for a dog that will go with the flow. The Chow Chow is a cat-like dog. They love to snuggle and relax with their owners. Because they are sensitive to heat, they do not do a lot of exercising. All the Chow needs is a short walk daily, but be careful when the temperature is hot. This is a serious-minded breed that is very bright, making them very easy to train. 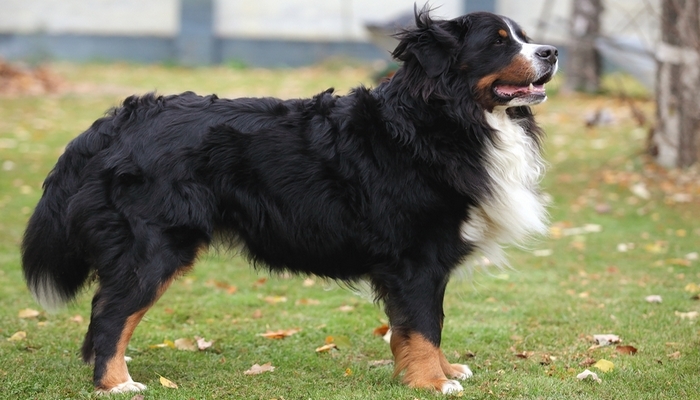 One of four varieties of Swiss mountain dog, the Bernese Mountain Dog is a sweet, family-oriented breed. This dog is an excellent stand in for a stuffed animal and will cuddle with you all day despite his large size. They only need a few longs walks a day. Calm and good natured, this is another of the lazy dog breeds that is ideal for families with young children. The St. Bernard is a great watch dog that will lounge around the house all day. They need to be socialized and trained early to prevent disobedience that can be dangerous. Their size and bark will deter any unwanted guests. 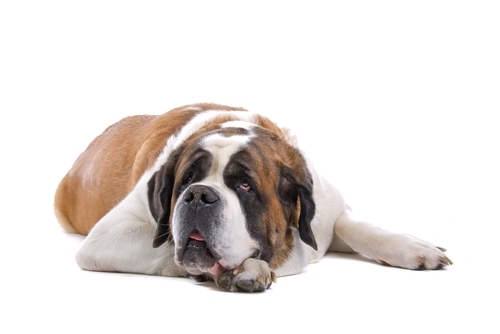 The St. Bernard is a heavy drooler, so this breed is not ideal for a pristine home. 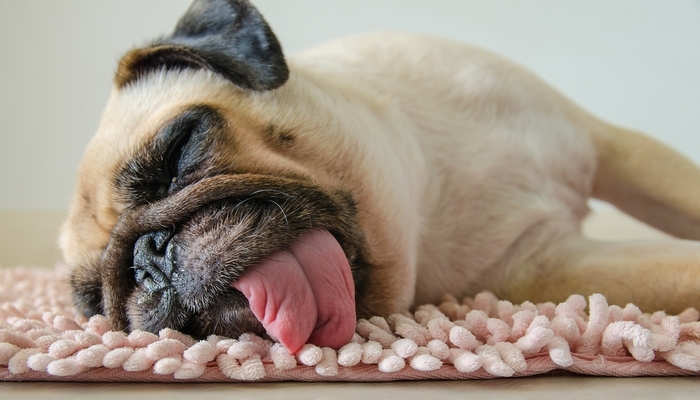 It is often very difficult to get this breed to exercise, hence why they made our list of lazy dog breeds. Motivating your St. Bernard to get up and exercise is imperative to his overall health and well-being. The dog breed chosen by Queen Elizabeth herself, the Pembroke Welsh Corgi is very smart and easy to train. They are great with children but, may need some early training to stop nipping. Corgis get along with other animals, especially cats. The only exercise these guys need is a couple of short walks a day but they require an appropriate Corgi dog food diet. This breed is also very affectionate and will enjoy time spent snuggling on the couch with his owner. The Min Pin, as they are affectionately called, is a spirited dog for an experienced owner. They can be aggressive if not given the proper training early. They love to curl up on the couch and just chill out. However, they do need several short but extensive walks a day. What puts this breed on the lazy list is the fact that they aren’t high maintenance once trained. The Chinese Crested will certainly attract attention wherever it goes. Their odd looks make them very popular. They are kind and great for first time owners. This breed will also do very well in apartment life. Chinese Cresteds only needs a few short walks a day with some indoor playtime. The hairless variety needs sunscreen when outdoors, because they will get sunburn. This dog will get along with almost everyone. They are very loving and sweet. Obedience training is a breeze with the Coton de Tolear. They adapt to the lives of their owners, which makes them great for city living and owners with busy schedules. This breed does need to be taken on a couple of long walks every day, but in between the walks they will be happy to cuddle up with you on the couch. These dogs are very intelligent and their happy-go-lucky personality will keep you smiling.